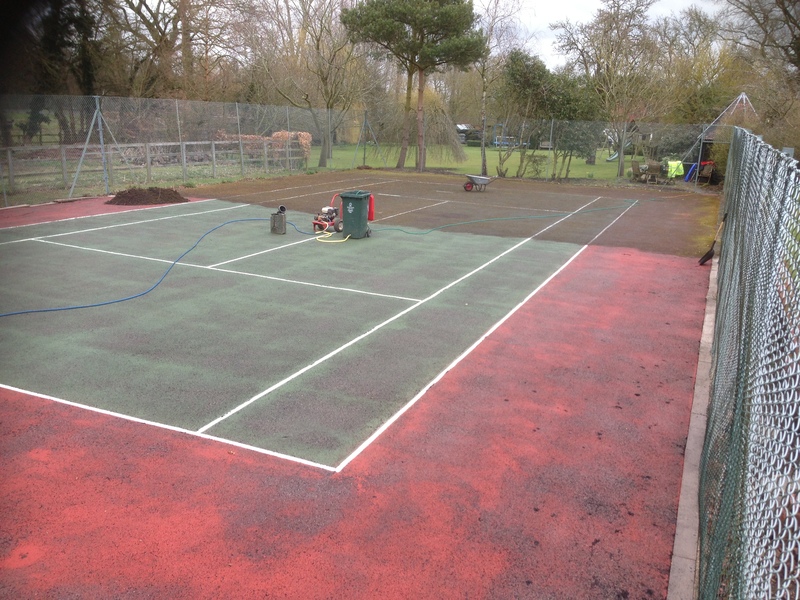 We are specialists in tennis court maintenance offering a number of services for schools and clubs across the UK. 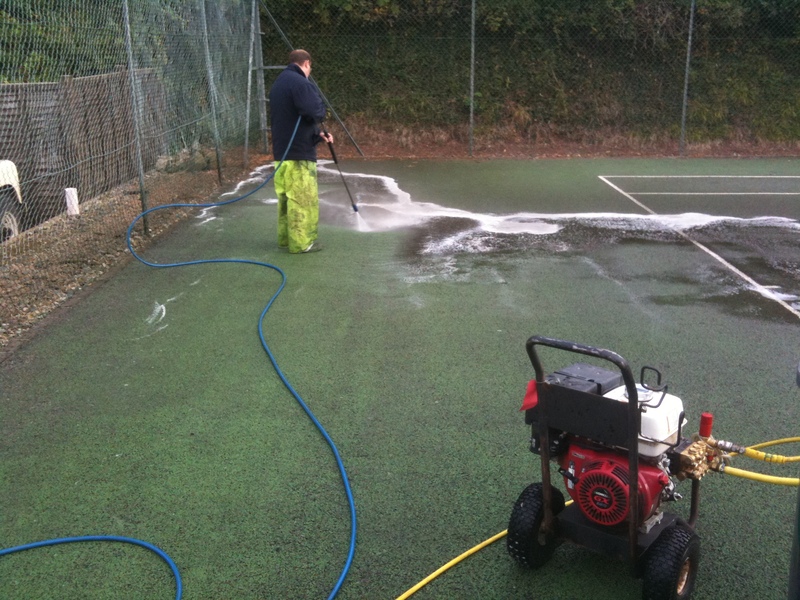 Our team can carry out cleaning, repairs and rejuvenation for many different types of sport surface. 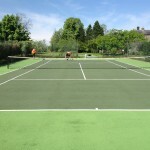 These include artificial grass, tarmac courts and polymeric rubber surfacing in a variety of specifications. It’s important to look after these facilities to make sure that they offer the best playing qualities and are completely safe for players to use. We would be happy to give you some more information on everything we offer, along with prices for the service you need. 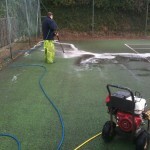 Feel free to contact our team today if you need us to carry out tennis court cleaning or paint your sports surface. One of our experts will get back to you with some information about the costs for this work. 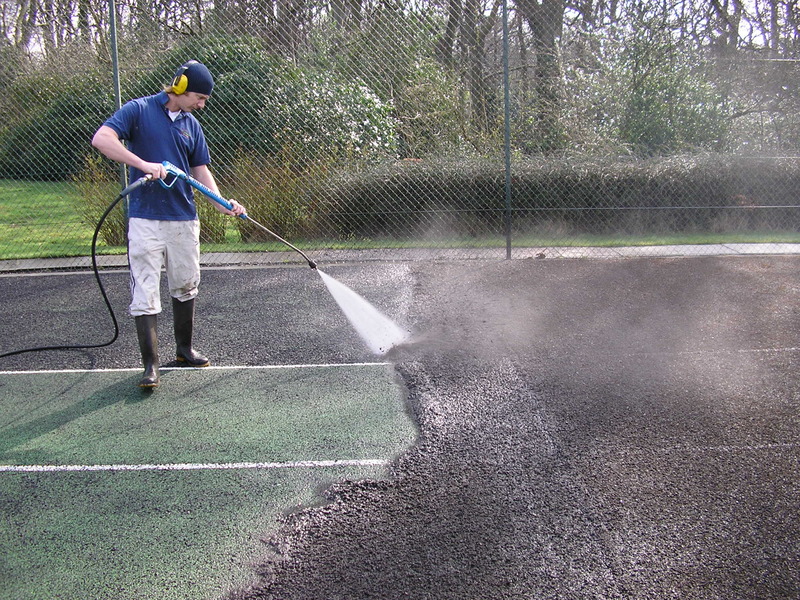 Tennis court maintenance is important as it helps to prevent problems such as flooding, moss contamination, surface damage and general wear and tear. These can make the surface unsafe and be costly to deal with if they are not fixed. Cleaning to the surfaces could include regular brushing and pressure washing to keep the area free from dirt and debris. Other methods of tennis court maintenance include fixing minor damage, relining and repainting if the original paint has faded. Chemical treatments can also be applied to prevent growth of moss and algae. 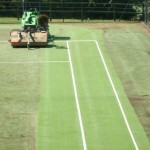 Having a regular sports court maintenance schedule helps to improve the durability of your tennis facility. It also keeps the surface safe for players and ensures high quality performance characteristics. Keeping your court surface properly cared for also helps to stop floods by maintaining the porosity of the surface. This allows for good water drainage and ensures that the sports flooring is SUDS compliant. In the video above you can see a full clean and repaint for a tennis court which was heavily contaminated with moss. Our team cleaned the surface thoroughly with a pressure washer and applied a chemical treatment to prevent further contamination. We then added a new two tone green paint coating along with fresh white line markings, giving the facility a brand new lease of life. With regular use over a long period of time, sports facilities can become damaged and worn out. This is more likely to happen if the surfacing isn’t looked after properly. If you have a hard court made from macadam, this could become cracked or start to have fretting, where the stones in the surface come loose. We can complete a tennis court repair for this by filling in cracks with an emerald stone mixture, or applying a binder coat to strengthen the whole court. 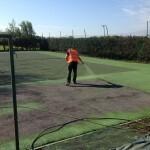 For a synthetic turf facility which is showing signs of damage, there are a number of things we can do. If the carpet is ripped or pulling away from the base, we can complete a repair for this. Other issues might include waterlogging or contamination with moss and algae, and these affect the playing qualities. This can be fixed by carrying out a thorough clean and chemical treatment, or a rejuvenation may be needed to remove and replace the sand infill. The level of maintenance required will depend on the conditions of the flooring, but we’d be happy to offer you some advice on this. The costs of maintaining a pitch can vary and are dependent on factors such as the specification and area dimensions of the surface. The condition of the surfacing and how often the facility is used also has an effect. Carrying out regular maintenance can help to reduce costs for your organisation as it means there will be less need for repairs or resurfacing in the future. 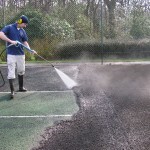 It is important to have servicing carried out by a specialist sports surface company. Then you will be sure that you get the best results and that your facility is safe for use. Having a good quality court which is properly maintained can also increase revenue for your organisation. It means the facility can be rented out and used in all weather conditions and at all times of year. Other local clubs and groups will then be able to use the court for recreational games and competitive matches. 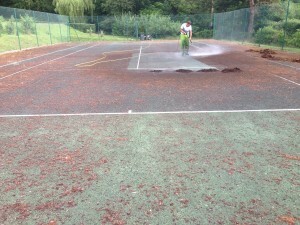 With increased use from others it would be even more important to clean the court surfacing as often as possible. We can offer many services to clean and maintain your facility in the UK. Our staff will be able to help you find the best specialist maintenance method for your sports surface. It’s important to use a contractor with a wealth of knowledge to make sure you get the best quality services. The costs for maintaining your sports flooring can also be kept at good value to help you stick within a tight budget. Please feel free to contact us using the form on this page. A member of our team will get back to you as soon as possible to offer advice for your enquiry. So over the years contractors have seen the two tone colour designs vary considerably from the basic light green, dark green. The greens were seen to be great because blended in with the surroundings however a few years ago everyone seemed to go mad for the light blue, dark blue designs as they was vibrant and looked amazing. Nowadays it is a complete mix of colours from customer to customer where they are wanting purple, red, grey, blue and green in contrasting colours. You could choose to turn the facility into a multi use games area by adding different coloured line markings for a range of sports as well. This is ideal for schools and leisure centres who want to offer many different activities in one place. We have completed numerous different projects for schools, colleges, clubs and domestic homes so we have a wealth of experience in doing this work. Our experts will be on hand to offer all the advice you need and provide more information about our products and services. Just let us know what you need and we’ll be on hand to assist you throughout the whole process as well as offering a great value quote. 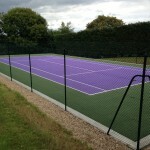 Let us know your thoughts on what you feel is the best colours for tennis courts. Our specialists are able to paint the surfacing in any colour you require. 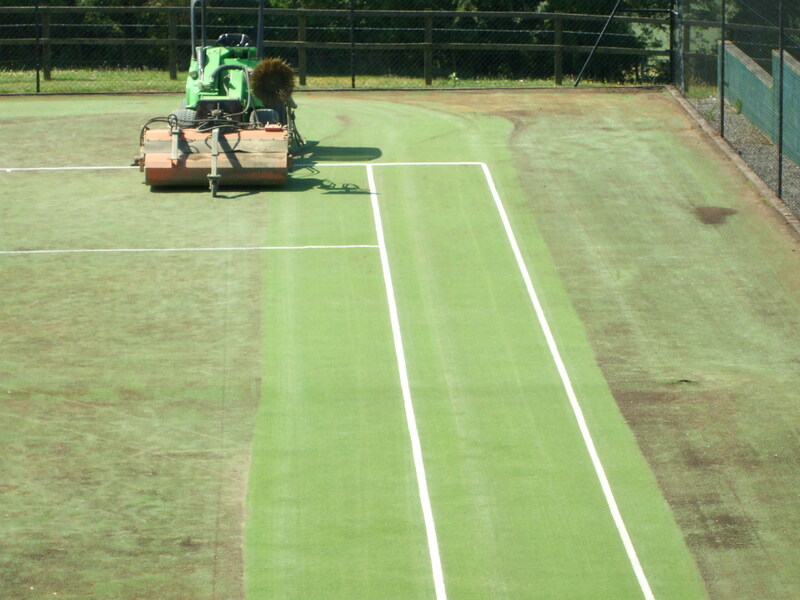 Be sure to get in touch through our contact form to receive a quote for tennis court maintenance at your facility. 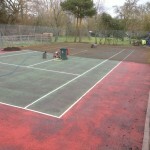 Below you can see references for some of our completed tennis court maintenance projects. This project was carried out to a residential garden in Hereford. 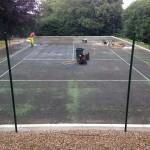 The existing tennis court was mossy and the anti slip paint coating had begun to fade. Our team thoroughly cleaned the area and applied a new paint coating in a two tone red and green design. For further details on projects similar to this, feel free to contact our team today.